The primary function of a transport or cargo aircraft is to carry payload, which is the portion of the useful load, passengers, or cargo that produces revenue. 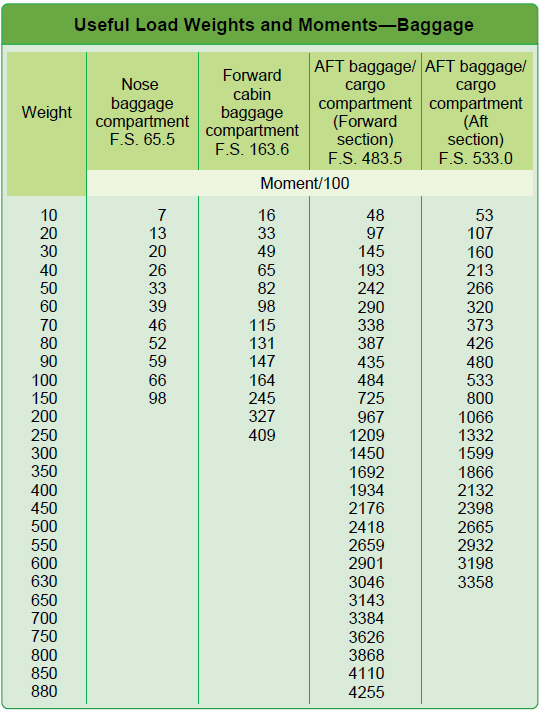 To determine the maximum amount of payload that can be carried, both the maximum limits for the aircraft and the trip limits imposed by the particular trip must be considered. In each of the following steps, the trip limit must be less than the maximum limit. If it is not, the maximum limit must be used. Figure 9-30. Finding the maximum takeoff weight. Figure 9-31. Determining zero fuel weight with lower trip limits. Figure 9-32. Finding maximum payload with lower trip limits. Under these conditions, 27,500 pounds of payload may be carried. It is important to know the landing weight of the aircraft in order to set up the landing parameters and to be certain the aircraft is able to land safely at the intended destination. Figure 9-33. Standard atmosphere table. 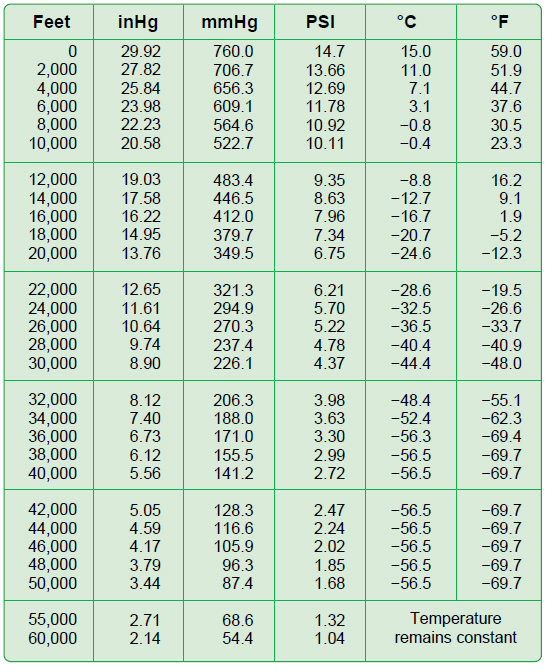 Use the U.S. Standard Atmosphere Table to determine the standard temperature for 16,000 feet (–16.7 °C). The ambient temperature is –32 °C, which is a deviation from standard of 15.3 °C. (–32° – (–16.7°) = –15.3°). It is below standard. 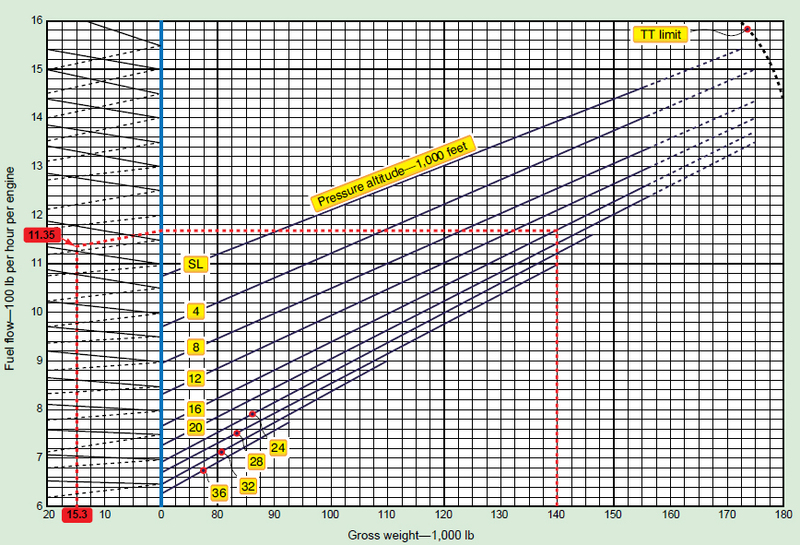 In the gross weight table, follow the vertical line representing 140,000 pounds gross weight upward until it intersects the diagonal line for 16,000 feet pressure altitude. From this intersection, draw a horizontal line to the left to the temperature deviation index (0 °C deviation). Draw a diagonal line parallel to the dashed lines for Below Standard from the intersection of the horizontal line and the Temperature Deviation Index. Draw a vertical line upward from the 15.3 °C Temperature Deviation From Standard. Draw a horizontal line to the left from the intersection of the Below Standard diagonal and the 15.3 °C temperature deviation vertical line. This line crosses the fuel flow–100 pounds per hour per engine index at 11.35 and indicates that each of the four engines burns 1,135 (100 × 11.35) pounds of fuel per hour. The total fuel burn for the 4-hour cruise is shown in Figure 9-35. Figure 9-35. Determining the total fuel burn for a 4-hour cruise. The airplane gross weight was 140,000 pounds at takeoff with 18,160 pounds of fuel burned during cruise and 1,350 pounds burned during the approach and landing phase. This leaves a landing weight of 140,000 – (18,160 + 1,350) = 120,490 pounds. Most large aircraft are approved for a greater weight for takeoff than for landing. To make it possible for them to return to landing soon after takeoff, a fuel jettison system is sometimes installed. It is important in an emergency situation that the flightcrew be able to dump enough fuel to lower the weight to its allowed landing weight. This is done by timing the dumping process. Figure 9-36. 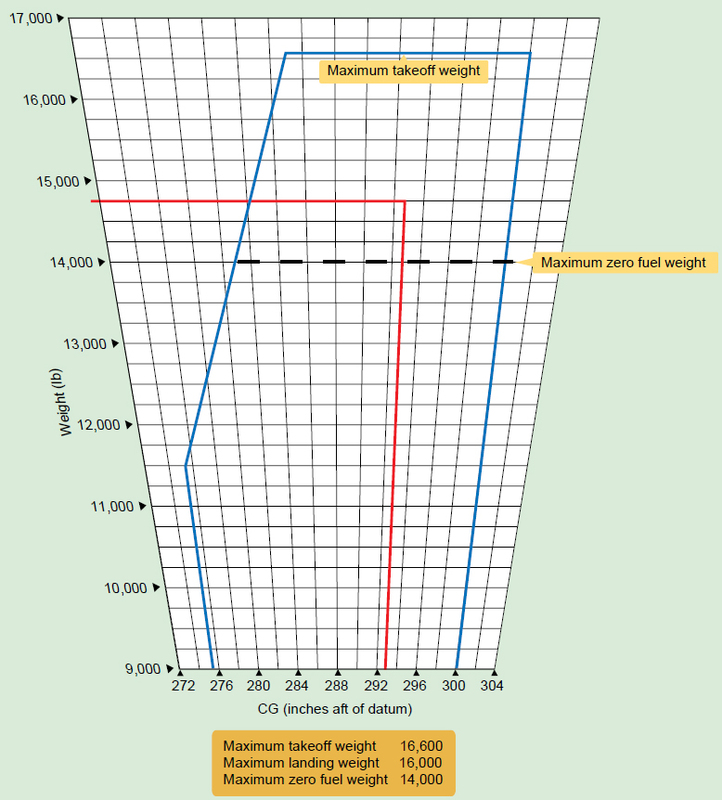 Determining the amount of weight the aircraft must lose to reach the maximum allowable landing weight. Determine the amount of fuel burned from the beginning of the dump to touchdown. [Figure 9-37] For both engines, this is 52.83 × 2 = 105.66 lb/minute. The engines burn 105.66 lbs of fuel per min for 19 minutes (the duration of the dump), which calculates to 2007.54 pounds of fuel burned between the beginning of the dump and touchdown. Figure 9-37. Determining the amount of fuel burned from the beginning of the dump to touchdown. Figure 9-38. Determining the amount of fuel needed to dump. Figure 9-39. Determine the time needed to dump fuel. The Beech 1900 is a typical commuter category airplane that can be configuredto carry passengers or cargo. 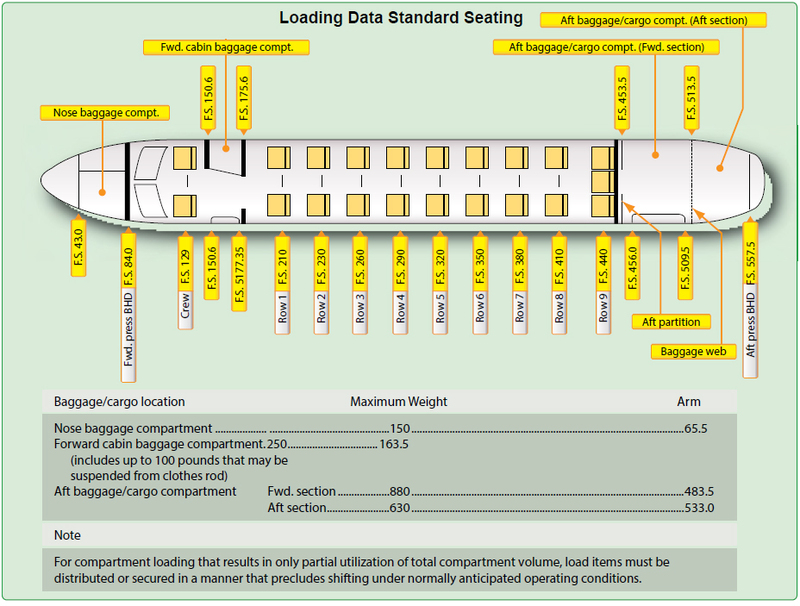 Figure 9-40 shows the loading data of this type of airplane in the passenger configuration. Figure 9-42. Weight and moments—occupants. Figure 9-43. Weight and moments—baggage. Determine the weight of the fuel. 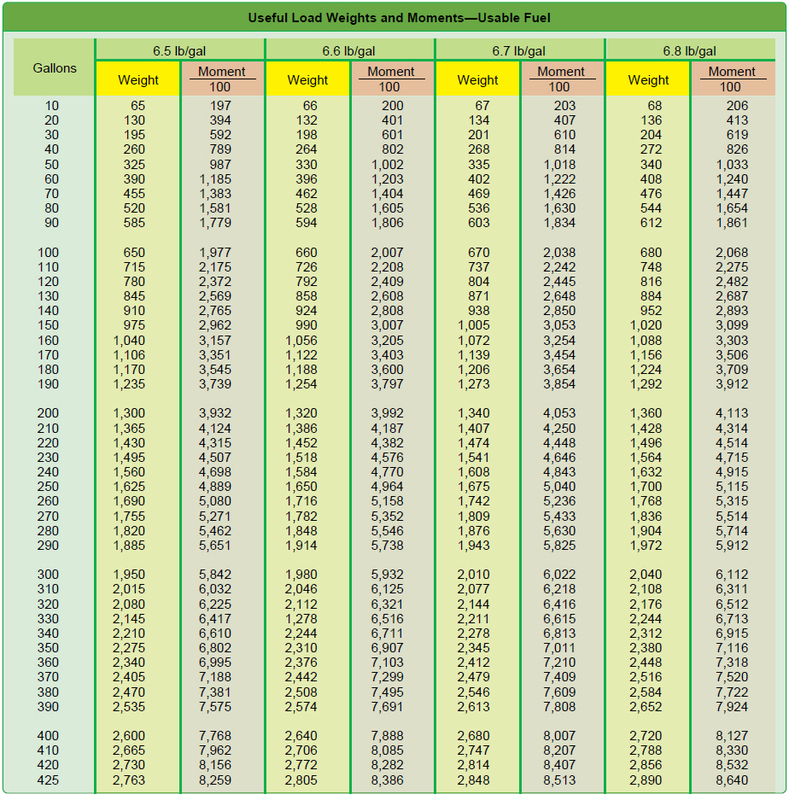 Jet A fuel has a nominal specific gravity at +15 °C of 0.812 and weighs 6.8 pounds per gallon, but at +25 °C, according to the Density Variation of Aviation Fuel Chart [Figure 9-44], it weighs 6.75 lb/gal. 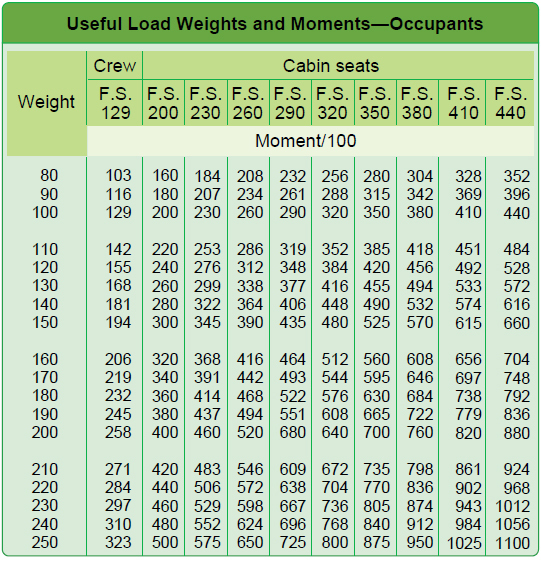 Using this chart, determine the weights and moment/100 for 390 gallons of Jet A fuel by interpolating between those for 6.7 lb/gal and 6.8 lb/gal. The 390 gallons of fuel at this temperature weighs 2,633 pounds, and its moment index is 7,866 lb-in/100. Check to determine that the CG is within limits for this weight. 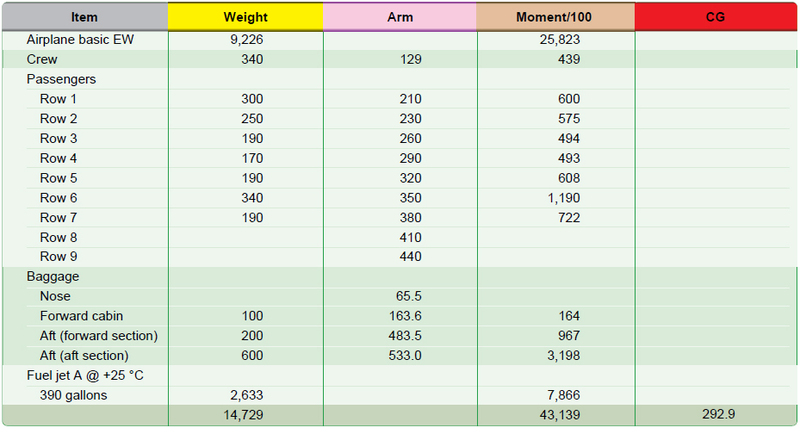 Refer to the Weight and Balance Diagram. [Figure 9-46] Draw a horizontal line across the envelope at 14,729 pounds of weight and a vertical line from the CG of 292.9 inches aft of the datum. These lines cross inside the envelope, verifying the CG is within limits for this weight.